A strong typhoon has hit Japan, killing three people and injuring at least 90. Typhoon Lan made landfall at Shizuoka, 175km (110 miles) south-west of Tokyo, at about 03:00 local time on Monday (18:00 GMT Sunday). Gusts of up to 198km/h (123mph) hit the country, its weather agency said. The storm, which drenched many regions over the weekend as Japan voted in its national elections, led to about 350 flights being cancelled on Monday, after 500 were cancelled on Sunday. What is the difference between tropical storms? There are also reports of passenger trains getting stuck overnight due to blackouts, while some Monday morning express train services and ferry services were cancelled. The victims included a man who was killed after being struck by scaffolding in Fukuoka, and a 70-year-old who died when he dived into the sea to try to escape his own boat, which was reportedly experiencing engine trouble. A man died when his home was hit by a landslide, while two people were in comas due to their injuries while about 90 people had lighter injuries, Japanese media said. 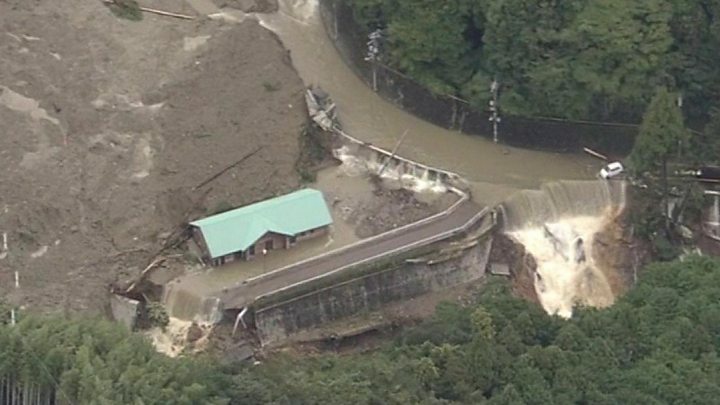 Hundreds of homes in west Japan were flooded, broadcaster NHK reported.